﻿ 3 Things Your Nonprofit Needs to Say After #GivingTuesday » Red Mango Marketing! Imagine it’s Wednesday, November 29th, 2017. #GivingTuesday has come and gone. You’ve participated in a global day of giving, raised some impressive funds, and gained valuable learnings to apply to the next year. Now it’s time to make #GivingTuesday your launching pad for record-breaking year-end donations. You absolutely cannot overlook the importance of expressing gratitude to your donors. Saying “thank you” reinforces that their donation matters and increases their investment with your organization. The most effective thank you emails are simple, straightforward, and above all, authentic. Take this opportunity to remind supporters of what their donation makes possible. You can also use your thank you email as a chance to give something back. Strong Women Strong Girls does a great job of this by inviting donors to celebrate a successful year during their Holiday Open House. Tip: Don’t be camera shy! Sharing a thank you video is a really engaging way to show your appreciation. What about the people on your email list who didn’t make a donation? Make sure they know that #GivingTuesday isn’t the only day they can get involved. Send a thoughtful We Missed You email to let your subscribers know how important year-end donations are to meeting your organization’s goals. Don’t be pushy here. Even if they’re not able to donate this time around, show them other ways they can help out. Encourage supporters to share a link to your donation page from their social media channels or remind them to refer your organization directly to a friend or family member who might be able to help out. Have you ever dedicated time, energy, and resources to something without knowing if your efforts paid off? Not a very nice feeling, is it? Definitely not something you want your donors to feel! Instead, treat your donors like important stakeholders of your organization. Keep them informed of the specific goals you’re trying to accomplish and how you’re faring. The more transparency you offer the more invested they’ll feel. Include anecdotal accomplishments as well as charts that show year-over-year results so your supporters know exactly where things stand and how they fit in. Plan your follow-up in advance so you can deliver impactful messages that drive action through the end of the year and beyond! It’s never too early to get started. You can begin drafting your #GivingTuesday follow-up email today. Want more last-minute holiday email ideas? Join us for a free webinar! 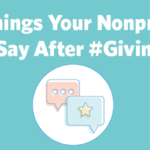 The post 3 Things Your Nonprofit Needs to Say After #GivingTuesday appeared first on Constant Contact Blogs. This entry was posted on Monday, November 6th, 2017 at 8:00 am	and is filed under Email Marketing, News & Updates. You can follow any responses to this entry through the RSS 2.0 feed. Both comments and pings are currently closed.